Is Wladimir Balentien worthy of baseball's home run record? Baseball is a game of statistics. But among the statistics, there are numbers that have greater meaning among both players and fans alike. One of those is the record for home runs in a single season. 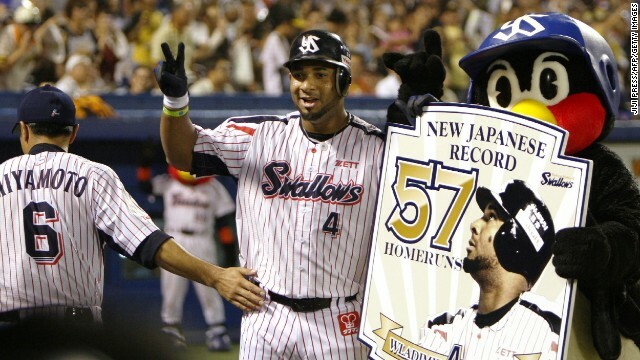 In Japan, that record was set by Sadaharu Oh, who hit 55 homers in 1964. In the years since, two other foreign players had equalled Oh’s mark. But recently, former U.S. major league player Wladimir Balentien finally broke through, hitting home runs number 56 and 57 in just his 113th game of the season. I’m not great at math, but one homer every two games is a fantastic accomplishment. Oh, but I have forgotten to mention the other issue that always seems to accompany home run records in baseball. Controversy. Balentien has set his record in a season where a new, bouncier ball was introduced to help produce more homers and liven up the game. The Nippon Professional Baseball organization finally admitted to the new ball in June, after months of denials. So does this taint Balentien’s record? Well, consider this. At the time he hit his 57th home run, no other player in the league had more than 37 homers and only two had hit at least 30. So not everyone was taking advantage of the livelier ball it seems. Balentien is a native of the Caribbean island of Curacao and played for the Netherlands at the World Baseball Classic earlier this year. He made the move to Japan in 2011. He had played three seasons of Major League Baseball (MLB) from 2007 to 2009, hitting only 15 home runs in total. So clearly, Japanese baseball is not on a par with the brand played in the USA. But the two leagues do share a penchant for controversy when it comes to home run records. The MLB record was set by the legendary Babe Ruth, who hit 60 in 1927. 34 years later, Roger Maris hit 61 in 1961. But many at the time wanted an asterisk next to Maris’ achievement, because by then the season had been lengthened from 154 to 162 games. Then came the famous (infamous?) 1998 season, when both Mark McGwire (70) and Sammy Sosa (66) broke Maris’ record. Three years later, Barry Bonds hit 73 home runs to break the record again. McGwire eventually admitted using performance enhancing drugs, Bonds was convicted of obstruction-of-justice by a federal court for the "evasive" testimony he gave in the 2003 grand jury investigation into the use of doping and Sosa was accused of testing positive by the New York Times in 2009. MLB has left all the records set during the so-called Steroid Era on the books. But the baseball writers eligible to vote on which players get into the sport’s Hall of Fame have so far shown little interest in letting anyone even remotely linked with doping into the Hall. But attitudes could change with the passage of time. Take for instance Balentein’s chase of the home run title this season. Some would argue that the biggest surprise was not that he set the record but the way the Japanese players and fans accepted the possibility that one of Japanese baseball’s most high-profile marks could be broken by a foreigner. Why the change of heart? It could be that the success of many Japanese players, led by Ichiro Suzuki, in the U.S. major leagues has helped Japanese fans change their view of foreign players plying their trade in Japan. It could be that in this time of ever-increasing globalization, barriers that once existed just no longer apply. Could a return to MLB be in the cards for Balentien? He is completing his third season in Japan and has clearly demonstrated his abilities at this level. At age 29, he is in the middle of what most believe are the prime years of a player’s career. Maybe it’s time to give it another shot. like yr comments , but I do not agree completely with you. MLB is an worldwide organization that all players would like to participate in and try to make the best out of it. There is no second chance in the MLB unless if you are liked, even so all odds are against you. He was batting in the MLB but was not given enough playable games and still have the longest HR in the MLB. So I recommend him to stay in Japan and try to break his own record nxt year. This post is a convoluted mix of myths, facts, and leading the reader to false conclusions. I was unable to find any information on how the poster, Gerard Farek, is supposedly knowledgable about Japanese Baseball. This one post was all I could find linking him with Japan at all, so please correct me if I'm wrong, but it appears he has no experience in this field. First of all, it's clear that he doesn't understand the controversy of the new ball this season. To understand that, one needs to go back to 2011 when the "unified ball" was introduced. Before then, home teams were allowed to use baseball from many different makers, the only rule being that they had to use the same ball for the entirety of a given series. Teams knew which balls were livelier than others, and would switch depending on who the opponent was for a given home stand. Bringing everyone under a single unified baseball was supposed to have the effect that Japanese pitchers would have an easier time adjusting to international competitions (i.e. the Olympics – which coincidently dropped baseball). Nonetheless, there was a serious problem with the manufacture of the new unified baseballs – THEY CONSISTENTLY DID NOT MEET SPECIFICATION OF BOUNCINESS. Test after test on the baseballs had them coming up short of what they were supposed to in distance. The balls were consistently deader than the specification specified. This was killing offense and something needed to be done. Nonetheless, home runs started going up this season as the ball is more lively than the previous two seasons. However, home runs are still not being hit at the same pace as they were before the unified ball was brought in. THE BASEBALL IS NOT A RABIT BALL like we saw here in Japan around 2009. It has the springiness of the LOW END of what it was originally supposed to be. Now, this is just one aspect of the article that, because the author is unfamiliar with Japanese baseball, is presenting misleading information on the topic of Balentien and his home run title. The rest of the blog post is riddled with other items that, out of a broader context, resemble true statements but are misleading innuendo. The misleading use of statistics is another issue in this post. Saying Balentien only hit 15 home runs in 3 seasons of baseball implies he played in three full seasons. He had 559 plate appearances across 3 seasons, or just about one single full season's worth.. But 15 home runs in a season just doesn't sound as lackluster as 15 across 3 seasons, does it? It also doesn't take into account Balentien's general improvement as a hitter. According to Hensley Meulens, who managed Balentien on the Netherlands team in the WBC, Balentien was no longer the free-swinging strikeout machine he was in America. He'd learned to hit offspeed stuff and was much more patient in his approach at the plate. The same shoddy writing has been used in the past regarding Tuffy Rhodes, who hit 464 home runs in 13 seasons in Japan, but "only" 13 in 6 seasons in MLB. Again, across those 6 seasons, Rhodes only had 675 plate appearances, so just over a single full season's worth of play. That doesn't take into account the type of hitter he was in his first "four" seasons. Tuffy started out as a speedy, light hitting leadoff hitter who had never hit more than 11 HR in a season, even in the minors. In the 1992-93 off season, he bulked up and changed his approach at the plate and hit 30 HR between Omaha and Iowa in 1993. Yes, he flopped with the Cubs, but for some reason, they were still trying to use him as a leadoff hitter, when he had changed his game to someone more suited to a 2-6 spot hitter. In Japan, he was put in the 3 and 4 spot and reaped the benefits. But of course none of that contributes to a story about how great MLB is and how inferior all other baseball surely must be. And we might as well just skip any discussion in the difference in what bats were legal in Japan before the 1980s vs what is legal now. Research and reporting might be misconstrued as journalism, and CNN hasn't done that since the 1990s. Instead of questioning the juiced ball in Japan today please go and look for the furthest hit home run in the MLB history was hit by Mr.Wladimir (Coco) Balentien and the ball was not juiced.So stop nocking on the kid. Well, Balentien has the RECORD in the USA for the longest homerun too...Our Balentien is the one with the record in your country with the longest far far away homerun. so eat it! enough said. BALENTIEN when in the majors did not get the opportunity to play every day so he could prove himself. Now that he got the opportunity, he is proven himself worthy. He comes from the same island as Andrew JONES, Andrelton SIMMONS of the Braves, Jurickson PROFAR of the Rangers, and other great prospects that this island is producing. A lot of the big MLB hitters are tainted by by steroids use. So do not underestimate this guys potential. He has one of the longest homeruns in MLB history playing for the REDS, 495'. Just because he is playing in Japan does not mean that he should not be praised. Give merrit to those who deserve it. Boring, boring, baseball. There hasn't been anything remotely exciting in this sport since the Redsox broke the voodoo of 80 + years to win the world series. This is really poor reporting, if I dare call it that. The ball is by no means juiced, Balentien was a young player when he was in the states, pitching in Japan is strong in terms of control, Balentien is under contract through 2016....Why go on, this error-filled "article" isn't worth my time reading. Please do a little reporting before you make up your own conclusions. I'm availalbe as a resource! Curacao love his Boy, Wladimir Coco Balentien and is very, very PROUD of him.